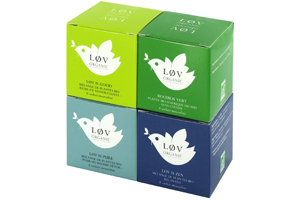 The perfect gift or a great way to discover the Løv Organic organic tea range. Delicious rooibos tea with tasty notes of apple and caramel. Delicate blend of white tea, green tea, green rooibos, peach and apricot. Exquisite blend of spices - aniseed, cinnamon, ginger, liquorice, and cardamom - full of antioxidants. In Scandinavian countries 'løv', means 'leaf'. Løv Organic is inspired by the Scandinavian way of life, combining pleasure and ecology in an organic range that makes everyday life more beautiful.